Even an exciting trip to the shops or park can suddenly be too much for our little ones. Using distraction to refocus them, using a little toy or two, attached to the buggy can often be a game changer! These purpose built toys can entertain with textures, noises and images to hold their attention. Clipping on - they are perfect for any type of travel. 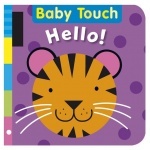 This bright and bold buggy book is perfect to keep the baby on the move entertained. Rylie racoon brings a kaleidoscope of fun and colour together!